"Perfection is a road, not a destination"
The M12 has a full steel roll cage, steel frame, and G.R.P. (fibre glass) composite clam shell body parts. These cars are extremely lightweight and stiff. Although looks to be track derived, the M12 performs very well on both road and track, with surprisingly good ride quality, but a rigid feel. The coupe evolved through four (4) variants, with the M400 being the ultimate version of the M12, followed by the GTO-3R. Noble M12 GTO-3 3.0L bi-turbo 352 bhp (262 kW). Noble M12 GTO-3R 3.0L bi-turbo 352 bhp (262 kW). The M400 is the track variant of the M12. Its power-to-weight ratio is over 400 bhp per ton, and is the figure from which its model name derives. It has 425 bhp (317 kW; 431 PS) and has been reported to do 0–60 mph (0–97 km/h) in as little as 2.97 seconds. Car and Driver (March 2007) achieved a 0–60 mph time of 3.3 seconds and a 0–100 mph time of 7.52 seconds. Although often listed as 0-60 mph in 3.5 seconds, the M400 generally comes in at 3.2 seconds according to various publications and generally listed amongst the fastest accelerative cars. 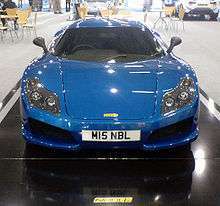 Noble indicates only that the car is capable of achieving 0–60 mph in under 4 seconds. Its top speed is listed as 185 mph (300 km/h). A top speed of 202 mph (325 km/h) has been achieved by Noble's former press officer. Lateral Gs are reported in excess of 1.2. It has both a 3-point seatbelt and a 5-point harness. In 2010, Noble began sales production of the M600. It has a Volvo twin-turbocharged V8 engine (producing 650 bhp (485 kW; 659 PS)), a carbon fibre body shell, and a 6-speed gear box, made by Yamaha. It competes in the same category as the Ferrari F430. The 2,800-pound (1,300 kg) M600 can accelerate from 0–62.1 mph (100 km/h) in 3.5 seconds and requires only another 4 seconds to achieve 100 mph (160 km/h). It has over 1G of grip on the skid pad. The brake discs in the Noble M600 are steel. 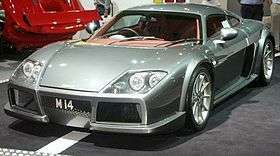 The Noble comes with no ABS or ASM and TC as those features will be optional, making the Noble M600 a pure driver's car. The British supercar will cost around £300,000 when it is launched, and only 50 will be made annually. Noble publicly tested an M600 prototype 2 in the USA, comparing its performance with a Porsche Carrera GT and Ferrari Enzo. This prototype was detuned to 500 bhp (373 kW; 507 PS). The M600 was featured again in Top Gear in a challenge to drive from Lecce, Italy to Rome. The M600 was driven by Richard Hammond while Jeremy Clarkson drove the Lamborghini Aventador and James May drove the McLaren MP4-12C. Along the way, the trio stopped at the Nardò Ring to test the driver's willingness to push their respective vehicles to their limits while in a perpetual corner. Following the track test, they continued on their way to Rome when Hammond experienced gearbox trouble in the Noble and had to have the car towed to a garage to disassemble and rebuild the gearbox. 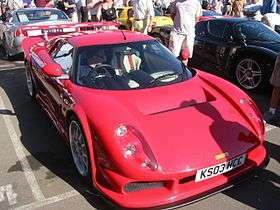 Hammond eventually rejoined his co-presenters and continued on with the rest of the challenge, albeit in a noticeably different M600 provided by Noble, the vehicle was right-hand drive and painted black whereas the vehicle Hammond began the challenge with was a left-hand drive car painted red like the Aventador and the MP4-12C. In 2012, the M600 was reviewed in Top Gear (U.S. TV series), in the last episode of the 2nd season, there Tanner Foust travels to England to test the new Noble M600. They introduce the segment saying: "Noble has not yet determined the top speed of the M600 and Tanner is tasked with determining the top speed of the vehicle". He races a Lamborghini Gallardo Superleggera and an Audi R8 in half-mile drag race. The M600 comes in first, beating the Superleggera in second and the R8 in third. Tanner then takes the M600 to an American Air Force base to determine the maximum top speed. Tanner drove the M600 to 215 mph. Tanner gives a generally favorable review of the M600. He praises the car for its large power to weight ratio and calls it "...one of the purest driving experiences around," due to its lack of driver aids. At the conclusion of his review, Tanner states, "The M600 has proven itself to be a member of the supercar elite." In the motoring show Fifth Gear (Series 17), Jason Plato drove the car up to 330 km/h (200 mph). On a video test of the YouTube channel DRIVE, Chris Harris (in which he also drove the Ariel Atom) drove it to over 205 mph (almost 340 km/h) on the Nordschleife section of the Nürburgring circuit. ↑ "Lee Noble announces his new supercar project". Bauer Media Limited. 19 November 2009. Retrieved 19 November 2009. ↑ Leicester, John F, (22 August 2009). "Noble car to be built in Leicestershire". Thisisleicestershire.co.uk. Retrieved 9 August 2011. 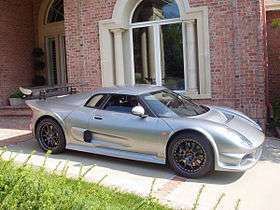 ↑ "Rossion Q1: New U.S. Supercar Comes From Noble Stock". Edmunds, Inc. 12 July 2007. Retrieved 8 April 2008. ↑ Neff, John (5 April 2006). "Noble M15 official pics and details". Autoblog. Retrieved 25 April 2015. ↑ Lienert, Dan (18 April 2006). "The New British Supercar". Forbes. Retrieved 16 January 2016. ↑ "Noble M600 Review". Top Gear. UK. Retrieved 7 October 2016. ↑ "Noble M600 Testing". Gtspirit.Com. 5 December 2008. Retrieved 18 September 2009. ↑ Chris-R (21 June 2012). "Exclusive! Noble M600 Roadster – the first (and only?) official pic". atfullchat.com. Archived from the original on 27 June 2012. Retrieved 23 March 2016.